HRM Sap Flow Meter is a self contained, stand alone instrument for the measurement of sap flow or transpiration in plants. 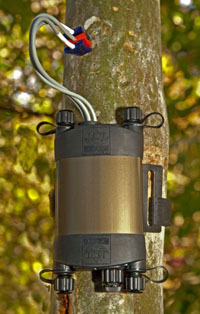 Utilising the Heat Ratio Method (HRM) principle the Sap Flow Meter is able to measure both high and low flow rates in both small woody stems & roots as well as large trees. Like the Heat Field Deformation (HFD) principle the HRM Sap Flow Meter is the only instrument that can measure zero flow and reverse sap flow rates. Making it the most powerful and flexible instrument for the direct measurement of plant water use. Heat Ratio Method (HRM) is an improvement of the Compensation Heat Pulse Method (CHPM). Being a modified heat pulse technique power consumption is very low using approx 70 m Amp per day at a 10 minute temporal sampling interval under average transpiration rates. measurements more accurate. Through microprocessor control, the inner measurement point can be activated or deactivated dependent on the specific wood anatomy of the species being measured. This provides a great flexibility in stem diameter range from >10 mm diameter woody stems or roots to the world's largest Redwood trees. This enables water flows to be monitored in stems and roots of a wide range of different species, sizes and environmental conditions including, drought or water stress.